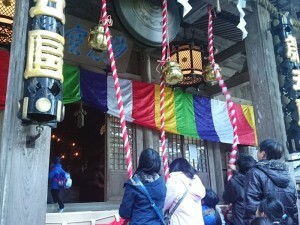 I went to Saijoji Temple in Mt. Daiyuzan with my friend to perform a Hatsumode at the beginning of the new year. 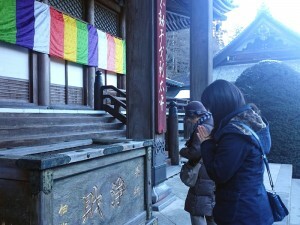 Not only many foreign tourists don’t know how to pray in a Japanese shrine or temple, I had asked my Japanese friend, it turned out she as a Japanese native also had some confusions. 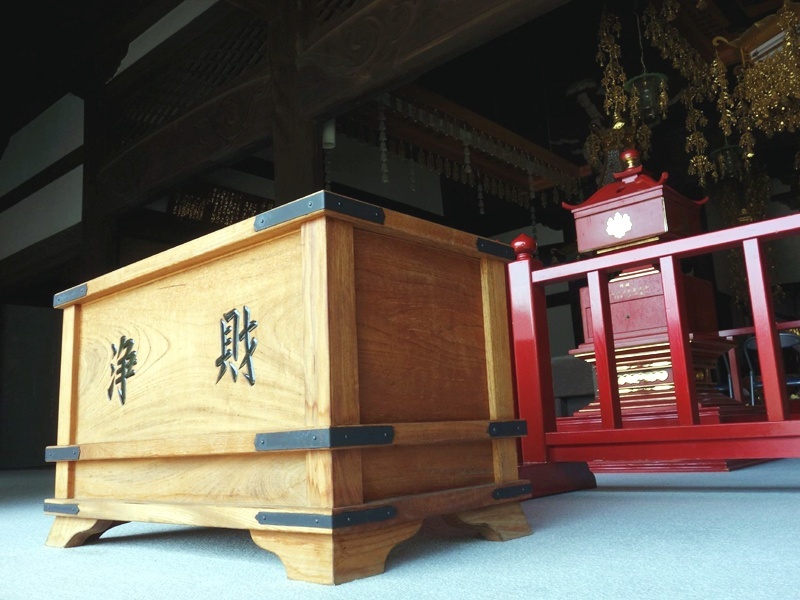 When praying in a Japanese shrine or temple, you have to pay your respect to god, behaving in a well mannered way to receive the bless from god. So I collected some information on how to pray just for your reference. 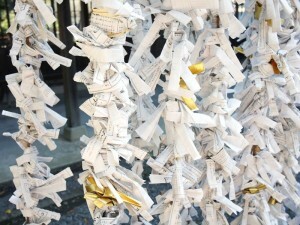 Every shrine has a Torii (large gateway to the shrine), you should bow once at the Torii, and walk pass the it to enter the path. After entered the path, you should walk on the side of the path. Never walk on the middle which is believed is the path left for god. 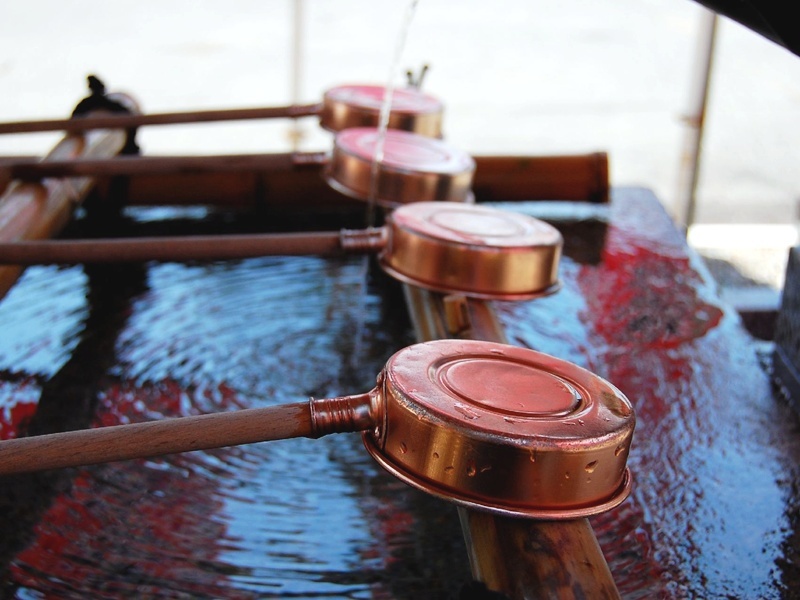 In old time, people had to purification and take a bath before praying. However the custom doesn’t exist anymore. 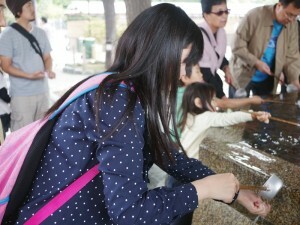 In stead, you have to wash you body at a water ablution pavilion along side the path. 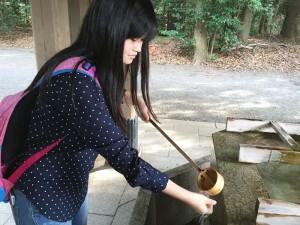 Use you hand to hold the handle of the Hishaku (a wooden ladle), clean your left hand. Hold the ladle by left hand, clean your right hand. Hold the ladle by right hand, pour some water in your left hand, use the water to rinse your mouth. After rinsing your mouth, clean your left hand again. Put the ladle in vertical direction, clean the handle of the ladle, put it back to the original place. Let me show you how to make a pray. First, bow your head once. Ring the bell with force. 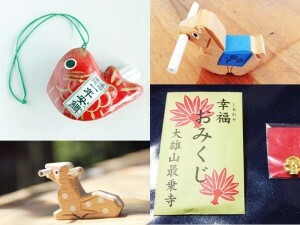 Just once is OK.
throw a few coins into the Saisenbako (a wooden box) quietly. The amount of the money is not important, just do what you think is appropriate. 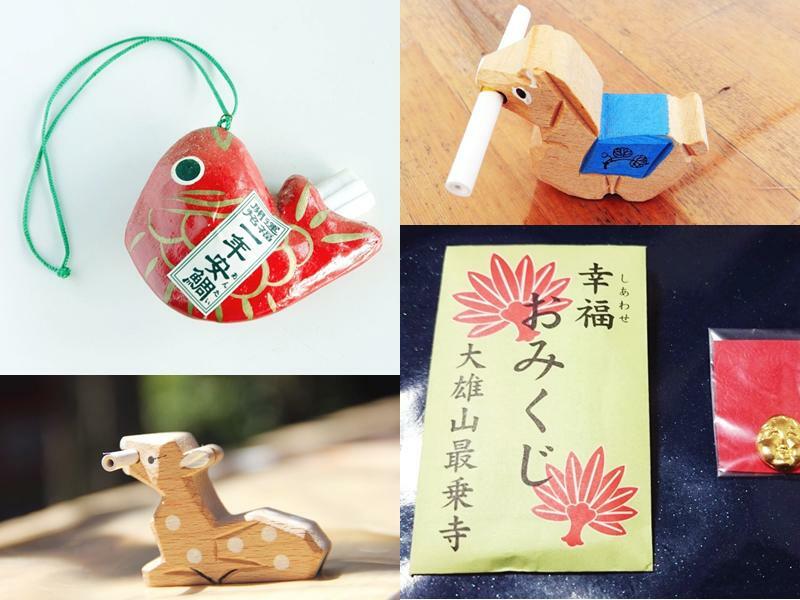 However 5 yen or 50 yen is considered to be numbers with good luck. Bow your head twice then clap your hands twice followed by another bow. Bow twice means that put your head deep down near to 90 degrees for twice. Clap twice means that to push out your two hands, put the palms together, put the left hand a bit higher than the right hand (left hand representing god, right hand representing yourself), move your two hands to a distance almost equal to the width of your shoulder, clap your hands for twice. After clapping your hands for twice, put your palms together once again make the pray. Drop your both hands. Bow for once means that put your head deep down once again. After you finished the pray, you have to return by walking on the same route, passing the Torii again, turn to the Torii to make a final bow. These four steps are the basics for praying in Japanese shrine. 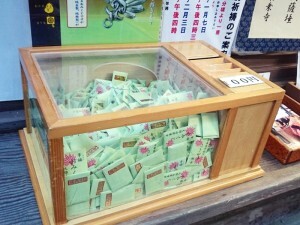 You can also experience ring the bell, drew a fortune slip etc in the shrine. 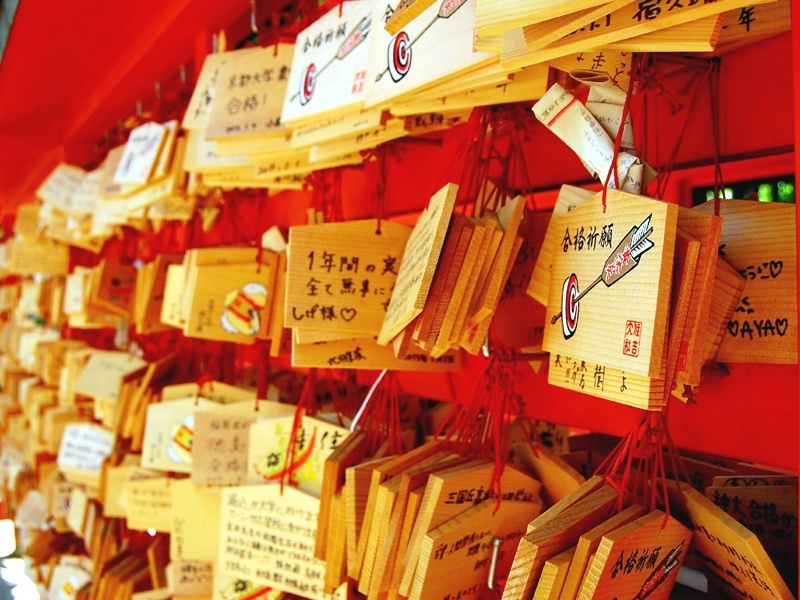 If you drew a “Kyo” fortune slip with bad luck, just tie the slip to a rack in the shrine, let god help you to convert the bad luck.